The playground has already been installed and if all goes well, Bravery Park in Orangeville should be completed by the fall. The Park is located on the grounds directly behind the Alder Street Recreation Centre. The project, which began with an idea in 2011, took hold in 2017 when the Bravery Park committee finally received a suitable site to create the park, which is designed to bring awareness to and honour Canadian Military members. Since the site was established, the work has progressed steadily. “This is not a memorial site,” stressed Bravery Park committee member Shannon McGrady, who said the committee does not want the Park to be confused with or be in competition with the memorial cenotaph located at Alexandra Park behind the Town Hall. “A cenotaph is for Remembrance Day. It's a sacred space to recognize fallen soldiers. The base for the memorial stone and statue are currently being made by a local company. Once completed the statue and memorial stone can be installed. 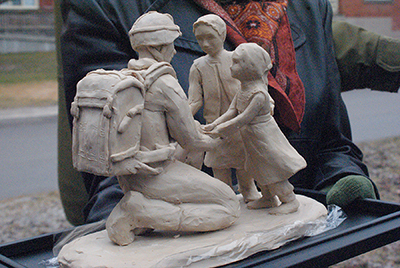 The statue features a Canadian soldier in combat gear with two Afghani children who are giving him a butterfly to reflect the compassion the soldiers are known for. The memorial stone will recognize all Canadian soldiers including the injured, those with PTSD, and those still serving. With Canadian military bases spread across the country, the average person, unless they know someone serving, may not have a good understanding of what the military accomplishes. “Unless you have a personal connection yourself, the average person doesn't know a lot about our Forces,” Ms. McGrady said. The Park also brings awareness to lesser known facts like suicide – which has plagued former members of the military after returning from duty in a hostile environment. The playground was completed with funding raised by the Amaranth Lions Club who ran a lottery over several years raising $35,000. The committee also received a monument grant from Veterans Affairs that will pay for the statue which was created by local artist Donna Pascoe and cast in bronze. There are several other similar parks around the country that have also been designed to honour all members of the military. Once the park is completed, the committee plans to hold a ceremony to officially open it to the public.